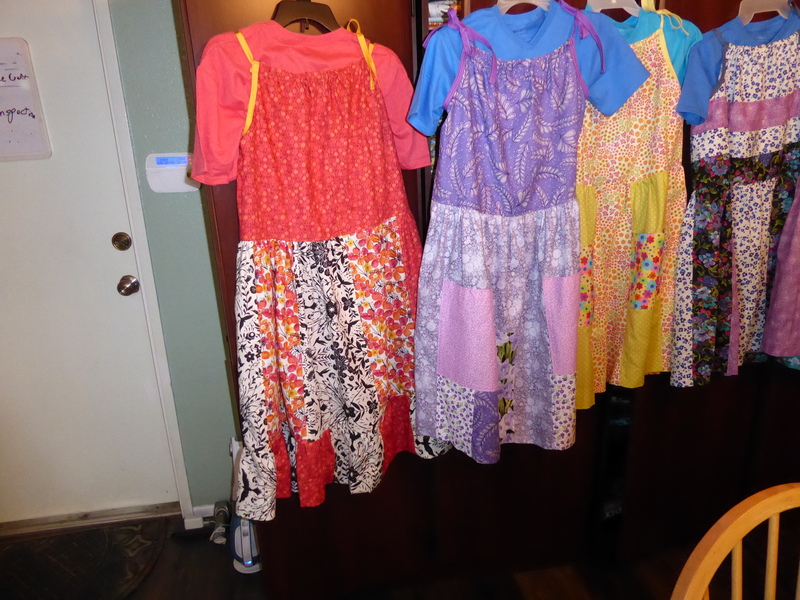 After making some repairs and adjustments to our home, I was finally able to settle down this past month and get some dresses and tote bags sewn for Little Dresses for Africa. A trip to the fabric warehouse only helped further my inspirations. 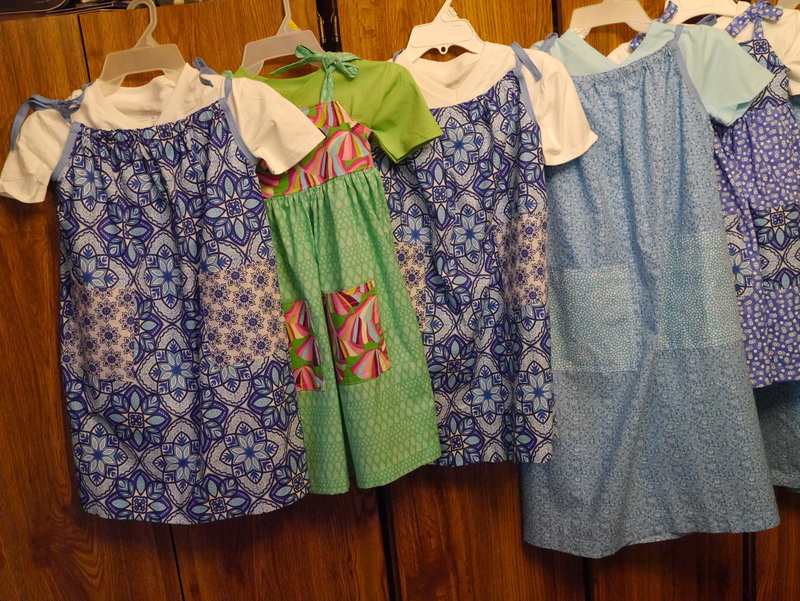 Unfortunately, for me, I can sew three or four dresses in a day but always put off actually packing them into boxes and getting them in the mail. That is why I am now taking time this week to finally take on that task. 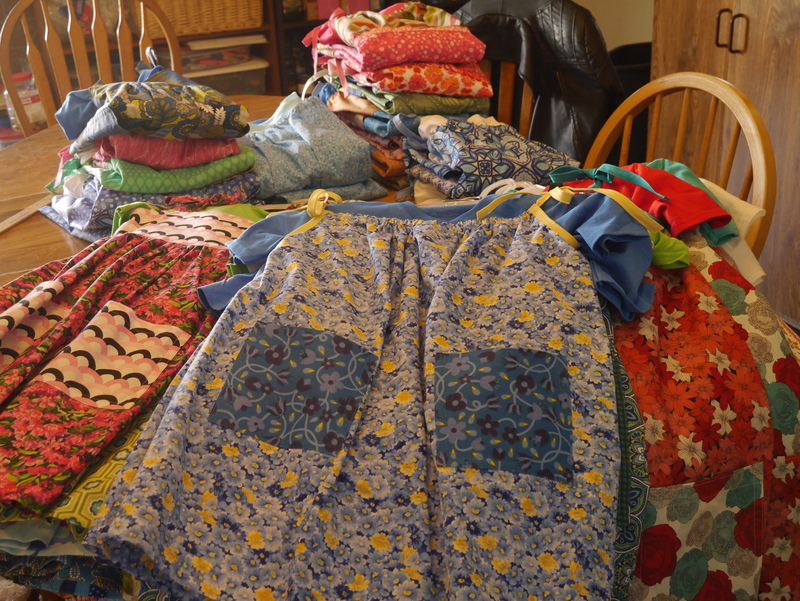 I have almost 50 dresses ready to go out and have run out of room to hang them in the meantime! 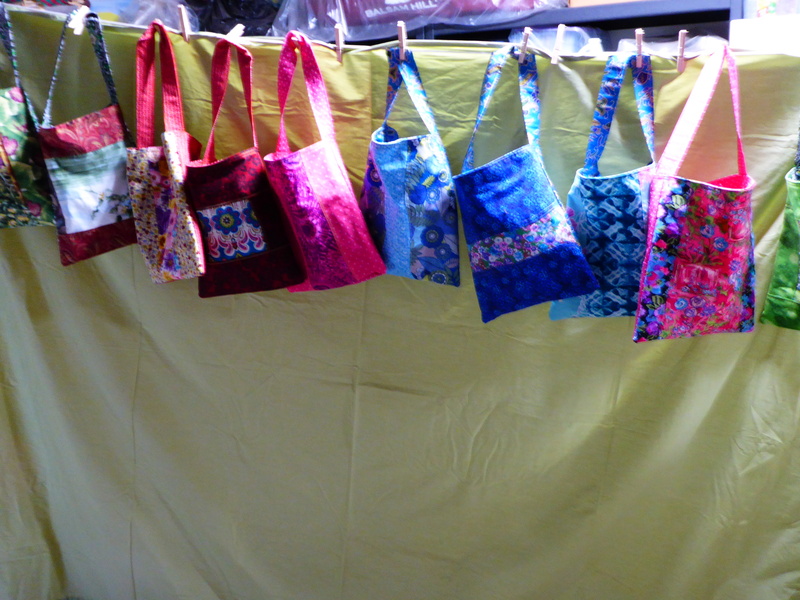 Tote bags are welcome, too, so my fabric scraps are getting put to good use. 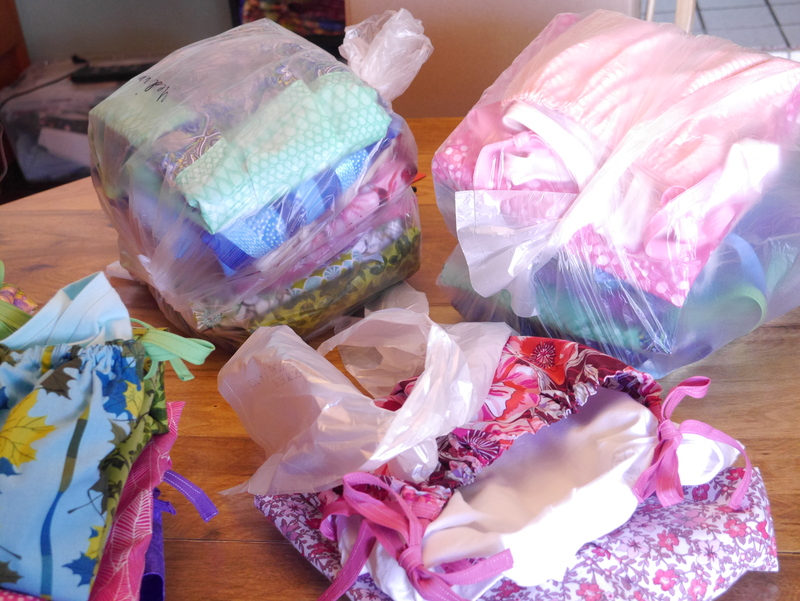 Blessed with some extra time this past month, I was able to make some more Little Dresses for Africa and spent this week getting them packed for mailing. 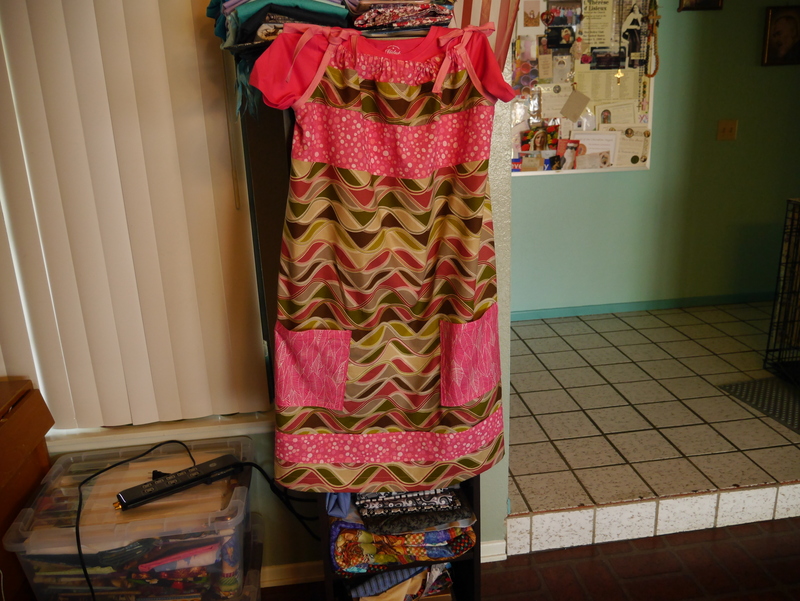 With my daughter grown, this has been a perfect outlet for sewing little girl dresses. 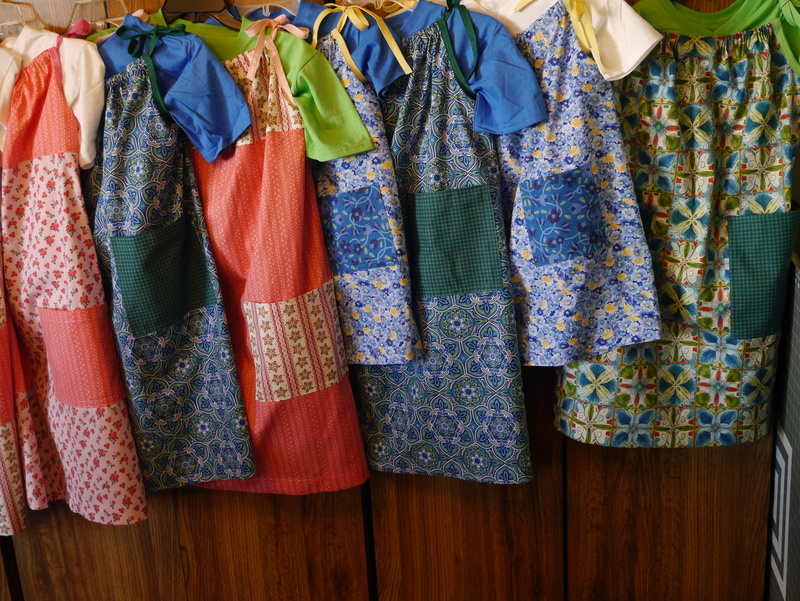 It is fun to mix and match colors, change the pattern around a bit to ‘invent’ a new look, and put decorative touches on the dresses with the addition of two pockets on every dress. Since I like to include a tee shirt with each dress, I often get remarks from other shoppers when I come to the register with an armload of them. One time, the lady in front of me at the check out asked what on earth I was doing with so many tee shirts and I explained. She suddenly got a glimmer in her eye and mused, “My babies are all grown and I STILL love to sew . . .” She immediately asked for information and I imagine she is busy with some worthwhile sewing even as I type! Another time, the cashier asked about my purchases and said she doesn’t sew a lot but the pattern seemed easy and said she was going to see about doing this, too. I had one of those weeks where I had plotted out days for sewing but every day brought an unexpected interruption. 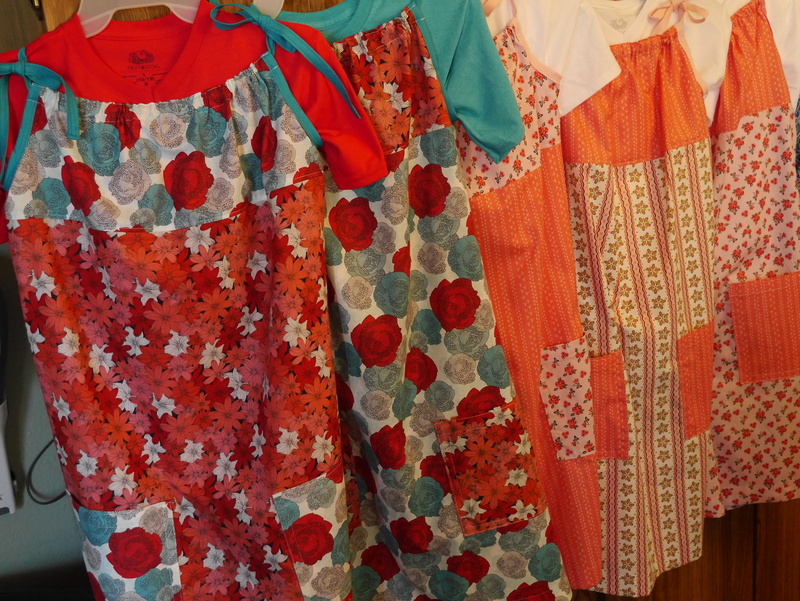 Nevertheless, I stole some time here and there and got another batch of dresses ready for mailing. 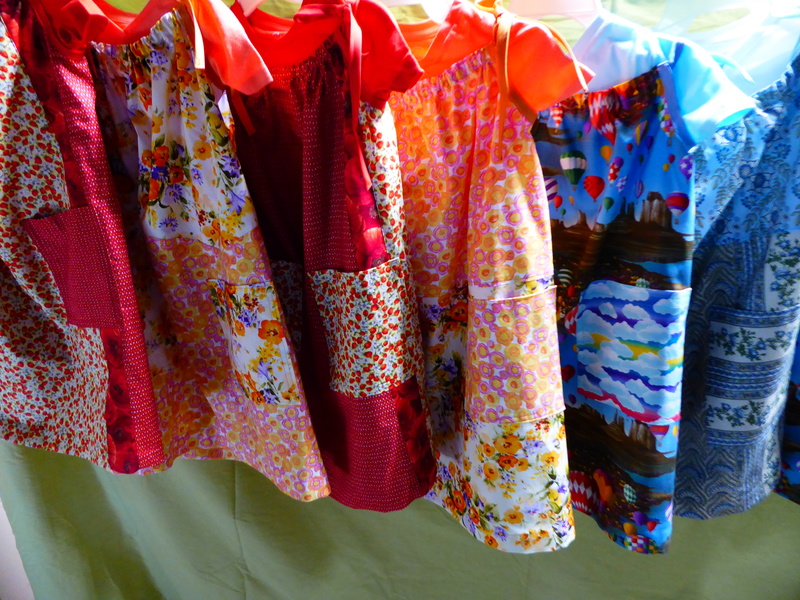 I realized, today, that I had been spending more time sewing than thinking about mailing out the Little Dresses I have been working on. I had twelve of them handing in front of my fabric cupboards and decided to spend the morning after Mass getting them sorted and packed. 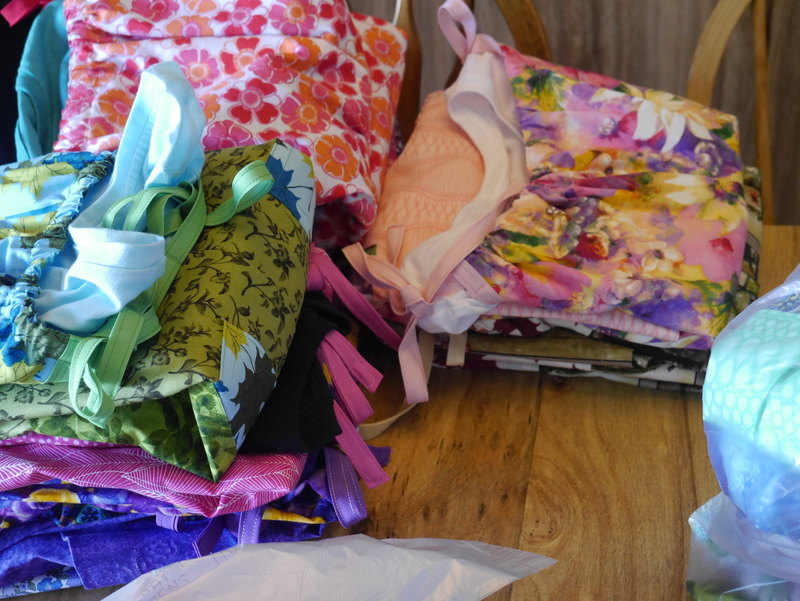 As I was sorting them according to size, I remembered that I had put ‘several’ completed dresses in a spare closet over the last couple of weeks so I went to get them into the mailing process, too. It ended up that I actually had 30 dresses completed so my box being mailed out this week by my kind husband weighed in at over 20 pounds! Have I learned my lesson? Nope! 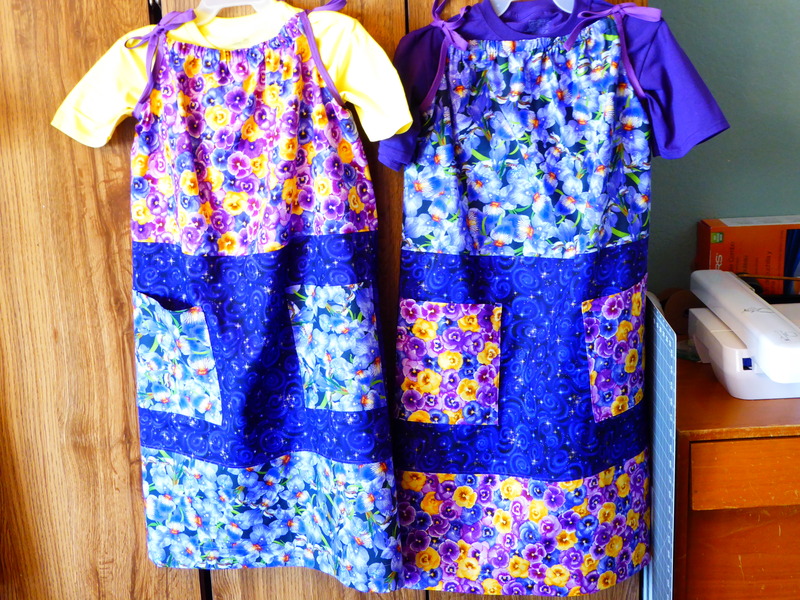 I found that I had made only medium and large sized dresses so knew my next batch would have to concentrate on making small ones. Already, I’ve been eyeing my fabric and matching up colors in hopes of having time this week to begin some more. 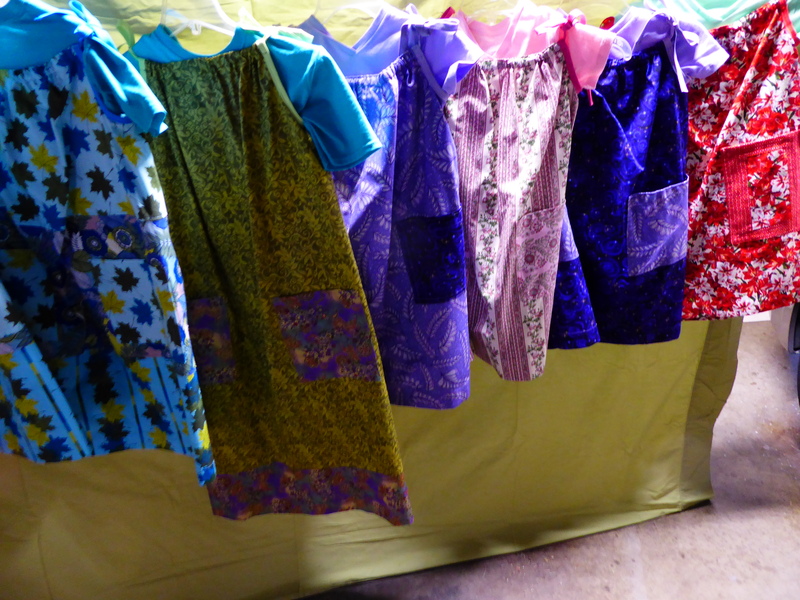 Remember to check out the Little Dresses for Africa site as they have other needs besides sewing dresses. There are many children in the world that could use some help.